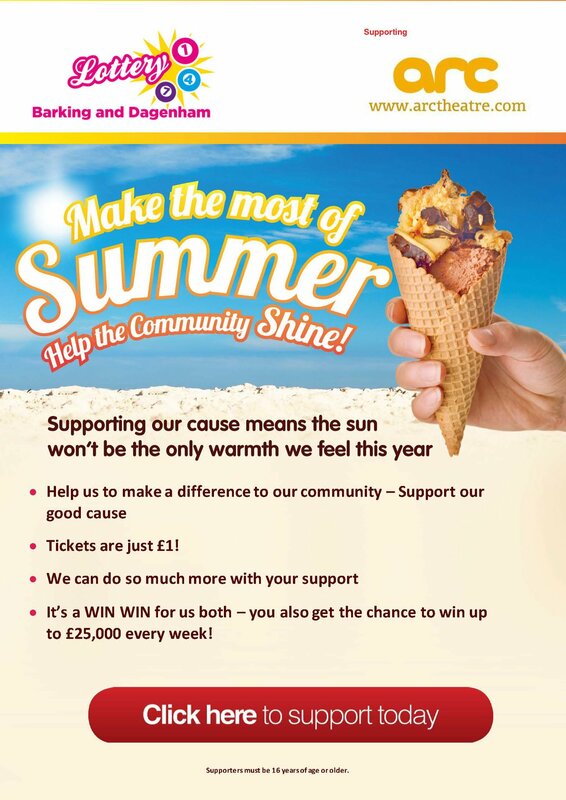 Make it a summer to celebrate by supporting Arc in the Barking & Dagenham Good Causes Lottery! Buying a £1 weekly ticket for the Barking & Dagenham Lottery in our name means that 50% of each sale will go directly towards helping us deliver work in the community! You don't need to be a Borough resident to purchase tickets for the weekly draw, which offers a £25,000 jackpot prize, and smaller prizes of £2,000, £250, £25 or three free tickets. There's a 1 in 50 chance of winning a prize each week, which means an excellent chance of return in comparison to the National Lottery's 1 in 14 million! Visit Barking & Dagenham Lottery and choose Arc Theatre as your Good Cause!